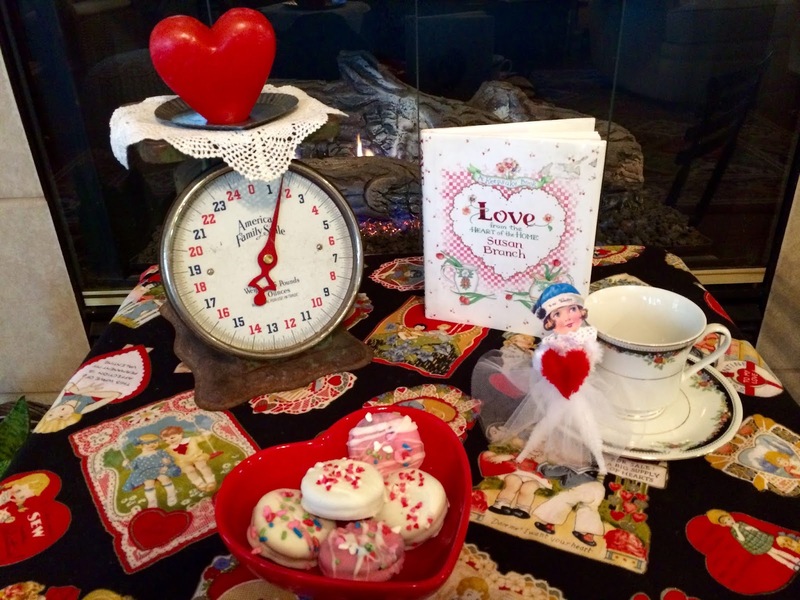 Each year I give my girls and granddaughters a Valentine Tea. It will be this Saturday. I love the chocolate covered Oreo's idea, I'll make them this weekend for our tea. Thanks Kitty for sharing. Love yourValentine's tablescape and decorations. I love the fact that you are teaching Cissy how to be a great hostess! That fabric is adorable! Enjoy your week! Happy Valentine's day, sweet friend! Oh, white chocolate covered Oreos! Yes, please! what a delightful little Valentine cloth, so so cute Kitty! Your vignette is adorable! I love the tablecloth! 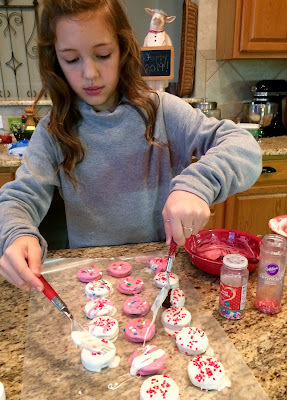 The Valentine oreos are a lovely idea and yes, so easy with the white almond bark. Several years ago my hubby and I took a factory tour at Wilburs' Chocolate in Freeport ME, and we made some white-chocolate covered oreos with spring-themed sprinkles at the end of the tour. It was a fun experience. Thanks for sharing with us! Always love to see what you and Cissy are up to. That fabric is very nifty! Glad that you kept a few treats to enjoy yourself. These look yummy! Your tablecloth is so adorable. What a great fabric find! I love the pretty tablecloth you made. 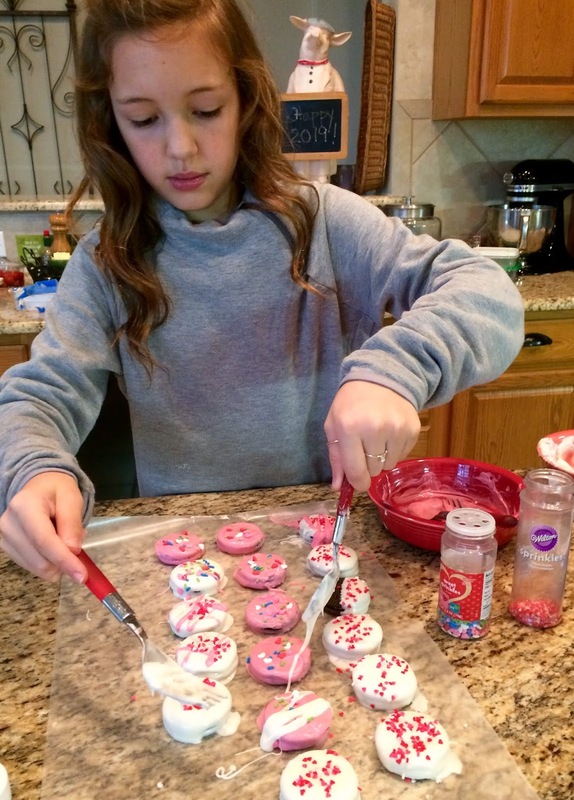 The cookies look so good and how fun to make them with Cissy! Hope you have a Happy Valentine's Day. Oh sorry Kitty, I forgot to thank you for sharing this also at our Cooking and Crafting with J & J ! I love everything about this table, but that cup is magnificent. Happy Valentine's Day, Kitty. Darling table cloth and table, Kitty. I recognize some of the valentine images on the fabric. How sweet it is! We love Oreo cookies, and have the peppermint bark ones in the cookie jar at the moment. They were limited edition for Christmas, so we bought a stash to keep in the pantry. Happy Valentine's Day! Thank you, Sarah! I'm so sorry that your email doesn't pop up on your comment, so I hope you see this. Your emails are sent as a no reply comment blogger. I appreciate your visits! Cute fabric Kitty! No doubt everyone enjoyed the cookies, good to hear the almond bark melted well. You never know when you might need to dip something in chocolate:@) Happy Valentine's Week! At first glance, I thought those were real Valentines on your table! 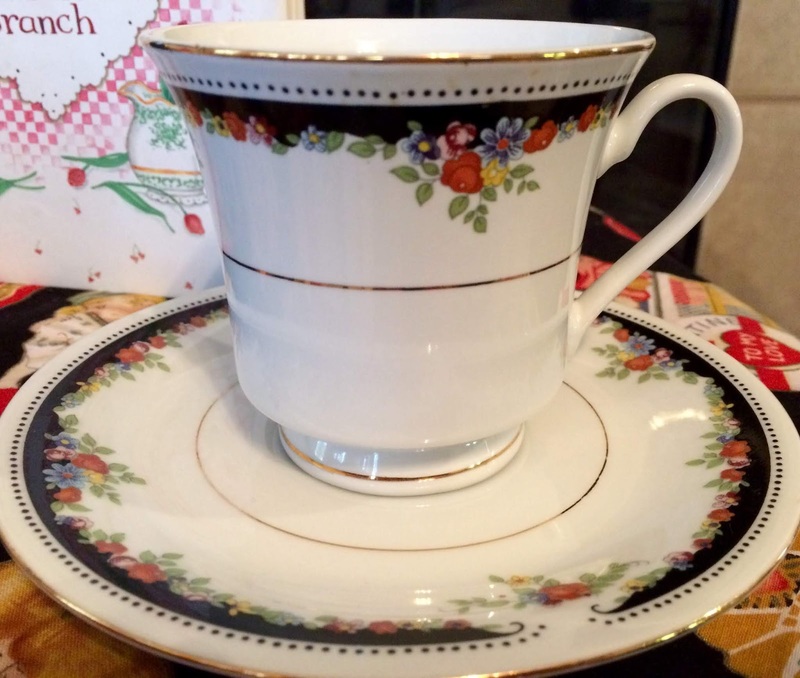 Love the vintage-inspired tablecloth and matching teacup! Yummy! Love this. I enjoyed this post. BTW we are neighbors I am in Keller! Kitty, I love your tablecloth. Don't we wish we had saved some of our childhood Valentines? Cissy is doing a great job icing and decorating the cookies. Wishing you and great week. Cissy looks like she is having fun! What a sweet vignette Kitty. Your little vintage girl and oh my goodness the tablecloth just made me melt! I see why you fell in love with the fabric, just gorgeous. How perfect to pull this out on VD and enjoy. I see you and Cissy made a batch of yummy collies to serve. What sweet Valentine's Day fun. Wishing you a very Happy Valentine's Day Kitty........hugs. Oh, those chocolate covered oreos look amazing!! And, so pretty, too! So sweet to visit with you today, my friend. Many blessings to you and Cissy! 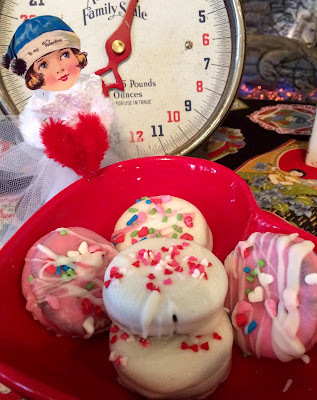 Love your great tablecloth and the delicious cookies!That teacup is pretty too!Hugs to Cissy and you! So much love and sweetness in this post, Kitty ♥ I love all of your decor and those chocolate covered oreos would be a hit with my grands too! Happy Valentine's Day! 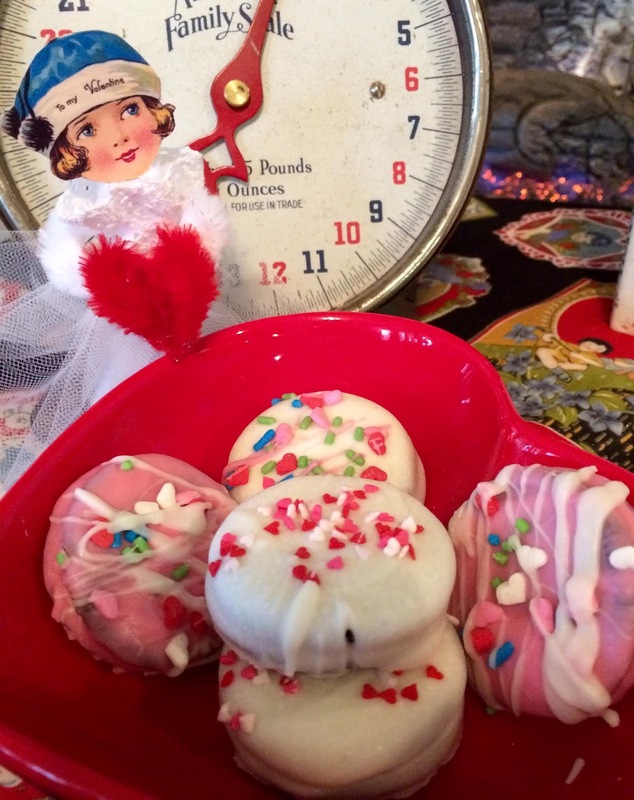 Cute (covered Oreo treats), cuter (tablecloth with doll & valentines), cutest (Cissy)! Happy Valentine's Day, Kitty! 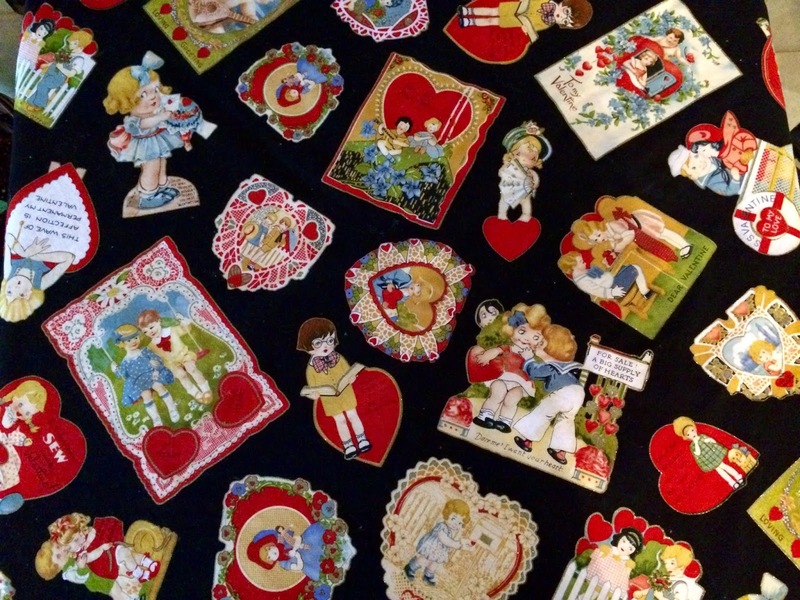 Such a fun tablecloth with all those vintage Valentines. Cissy looks like she knows what she's doing in the kitchen, thanks to your good teaching. Yummy Valentine treats! Oh my goodness, Kitty, I love, love that tablecloth!!! It's so different and so pretty! How perfect for a Valentine's Day table. Your teacup from Stephanie's teacup exchange is gorgeous, my friend! These chocolate-dipped Oreos are a great idea for a Valentine's treat. My uncle's wife makes these at Christmas, and we all fight over them when she gives to our family. :D I like the idea of using white and pink candy coating for Valentine's -- so pretty. Cissy is really a treasure, Kitty, but I know I don't have to tell you that. Have a wonderful week, my friend! Kitty, looks like you and Cissy are ready to open up a fancy confectionery shop! Sometimes it's fun to get a little fancy! How beautiful and how yummy! How is it that you who live in TX have a fireplace and I don't hahahaha! Your little table setting looks adorable with the little chenille girl there! Love the vintage Valentine theme, and your tablecloth. The teacup is so pretty too. Mmm, chocolate covered oreos are delicious! You know, I had some trouble with those candy melts a while back, I didn't know the trick about adding oil. Hope you are having a good week and staying warm. Thanks so much for sharing with us at Full Plate Thursday!